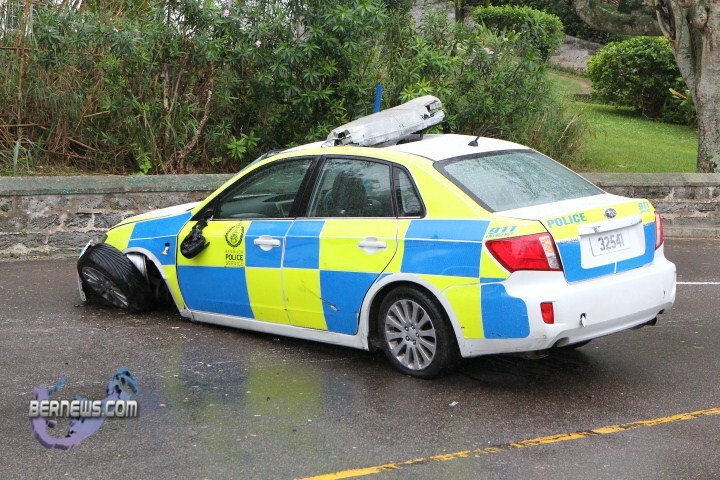 [Updated] At approximately 1.30pm this afternoon [Dec.26] there was a single vehicle accident involving a police car on Middle Road in Southampton, in the area by the Fairmont Southampton Hotel. Details are limited at this time, however unofficial reports suggest the car flipped over at some point, and the damage to the roof of the car does appear to also indicate that. It is unclear how many cars were involved and if any injuries were sustained, however we will update with official information as able. I am beginning to think the Police need to do “Project Ride” before they get behind any Police vehicle as how many of our tax dollars have they “road off” in the past few years? Hopefully, no one was seriously injured. WHAT A SHAME WE HAVE POLICE CARS THAT ARE IN LOTS OF ACCIDENTS WAY POOR DRIVEN!!!!!! I certainly don’t need a further update….blasted crash test dummies the bunch of that lot are! Another $30K down the drain because they just can’t drive. Left front tire/suspesion indicates something. Yoo follow….. Cops drive as bad as regular people. Government will find a way to replace the car by getting the money from the people. Epic fail. Why is it so important to make fun of this situation. The car can be replaced. How do any of you know whether the officer was responding to a call? I hope that the officer or officers are okay, and pray for a speedy recovery. Psssstt! !….ehh Police ‘driver’…..lil word of advice… just say because of your humane beliefs, you tried to avoid the ‘black cat or dog’, that happened to be crossing the road at the time…..trust me you stand a chance if you stick to that story….dont say you was looking @ your cell or texting….good luck explaining otherwise…..
Maybe they were using there cellphone while driving. Bermuda is an epic fail. Negativity everywhere on all subjects. Sad realy but shows the nature of what is left of the beast. Happy 2012. Thank you to the police service who are doing their best to help save our country..our community. save our country? this isn’t Afganistan. police don’t do anything in Bermuda anymore. you know how many police I have driven by and seen them on their blackberrys and textig? it’s ridiculous. Or did they piss off Hancock again and he just dropped um there? Whichever the case, what a wast of tax payers money on gas and paid time it took to train these men/women to avoid the unexpected… SMDH! do you mean ‘waste’ instead of ‘wast’?? if they were acting stupid they deserve it. is the “N” word called for? @Boom Bye Bye the only “N” word that probably wasn’t called for was “nation” because it seems the vast majority of commenters dont know what it means and do not identify themselves as key citizens of such. The second word “N!&&ER$” appropriately describes these people. Look up the full range of uses for this term. While defenitely a perjorative in all cases, it is not an exclusively racial slur, and how the hell could it possibly be when no one knows the race of the commenters?? By the way I’m black so just hurry up and forget about that. Now is your name “Boom Bye Bye” a colloquial phrase referring to shooting someone (boom) resulting in their death (bye bye) called for ?? You people disgust me – that is, those that “know” what caused the accident! I hope the officer is ok. If the officer was hurt the Police would have said, when anyone is injured that would be part of the report….the only thing hurt is his/her pride….n trust me having an inside feel….let that have been anyone of you driving your vehicle and see how the Police would joke about you……real talk……been there and seen that! !….so I know what I am talking about….so dont feel disgusted cause most Police feel traffic laws dont apply to them…..and how many of you dont know that a Police car is a regular vehicle unless it is attending an emergency…. @ Fiat Lux, Shut up! It’s a Subaru… Which is like a luxury capsule with wheels. These offices train on the same roads we drive on and have update maneuvers every so often… Look at the F-in update and see what cause the accident. If that vehicle would have hit a pedestrian and killed them, what would you have said about that? I’ve had a relative who was killed by a reckless cop and it should have never happen…. If I ever make a mistake on my job I would possible die just from one mistake. By the way stop complaining about people complaining, it puts you in the same boat…. clown! Feel free pass your name, address and phone numbers onto the police so the next time you call 911, they won’t bother answering you. hope driver did not have a few bumpers or was he on is cell phone? Berms justice system or lack there of has gone down the drain. If our cops just drove carefully this wouldn’t have happened. Ever been in town and they just turn there sirens on to get through traffic. Maybe we should bring in the UK force, they surly do a better job and they may even be able to stop all the violence. Bermuda is socially inept. Jen you’re an idiot!!! How old are you like 12? leave this conversation to the big people ok?? Your comments are not even worth replying to seriously!!! 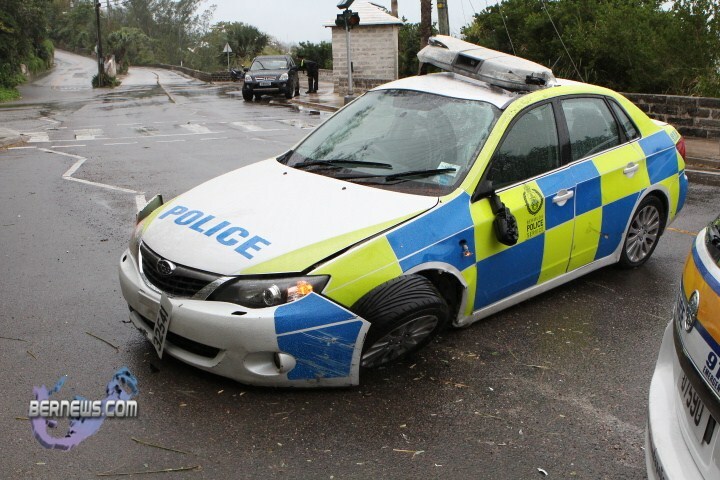 Face it, bermudas police force are all a bunch of idiots. Yup looks like they where texting to me lol!! Note the police spokesperson did not say that the vehicle was attending an emergency call, but only it was “traveling along Middle Road when it collided with a sidewalk and a wall, causing the vehicle to overturn.” Just stirring the pot…..
Was thinking the same thing!! Hitting a sidewalk or wall doing the speed limit will not cause the car to flip!Mmmm…regardless I hope the officer is alright. Not trying to be a hater here. I have seen countless times where cops are texting on their blackberry or talking on phone while behind the wheel. Of course I don’t want to see anyone hurt. But since there is STILL no report of an injury or police chase, it is very possible that this was careless driving on the drivers part. It’s OK though, they’ll just raise ferry prices again to get the money for a new car. I hope there are 40+ messages like this next time an idiot overturns his car at 3 in the morning for no apparent reason. Every time there is an accident involving a Police vehicle, there is always negative comments! Let me enlighten you about Police drivers: there are 3 grades of driving experience, most Police drivers are “authorized/standard drivers” which basically means you show that you are able to drive a manual (stick shift) car around Bermudas roads, no specialized training, and should only drive up to 50kph, and no use of emergency equipment unless stopping a vehicle or at an accident. The next two grades are response and advanced driving where driving courses are provided. Therefore, the majority of police drivers are not any better qualified than the average Bermudian driver, and we all know how many accidents occur each day on Bermudas roads. Now the other factor to consider is that a Police driver is behind the wheel for up to 10 hours on their shift, so accident do and will happen. As for tax dollars being wasted, firstly, that is what insurance is for, perhaps other Govt departments could save Govt wasted tax dollars like the inefficient W&E dept, but that’s another argument. Police are required to respond to “emergencies”, but most calls are to deal with minor issues that should not even involve Police, so if you can get your own house in order and drive carefully, you won’t need as many Police and therefore cars on the roads and therefore less accidents! thanks for the lesson CC but I recall police statements to most police accidents containing a little more information than this one i.e. police vehicle was responding to a silent alarm, oil slicked roads, etc etc…..but this statement is a little obscure, even you have to admit. I just wish that the Police would all call in sick for about a week and we would see just how much all the whiners would be begging for them to get back to work. 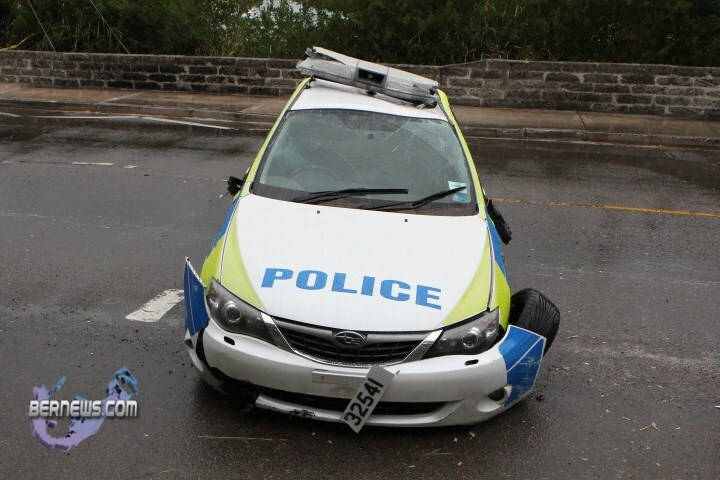 From what I can see….wet roads and the wrong type of tire tread for a police vehicle. @Fiat Lux no one’s being insensitive. I too hope that the police officer is ok but what you fail to realize that the police are human beings too and yes they do talk on their cell phones whilst driving, especially the West End crew. I seen it for myself and made a promise that now it’s time to take pictures and submit to their big bosses or the media to prove this point since you beg to differ about peoples opinions. Also details were very, very very sketchy at the beginning. Hope that Officer is going up for Due Care and Attention cause if it was one of us, a ticket would be issued before your car is towed away, trust me, its happen to me and the other car hit me, wasn’t even my fault, hello! See you in court officer. When a Police vehicle is on a response call and are speeding, honestly i do get nervous when they are approaching as I getm nervous becuase I am scared they are going to manouvre out of control and cause a crash. Hey Bernews…anything on that Shield Truck Robbery yet up at Hitching Post! ?5 guys and 5 guns??? ?This car was probably responding to it innit???? All wheel drive vehicle ?? ?